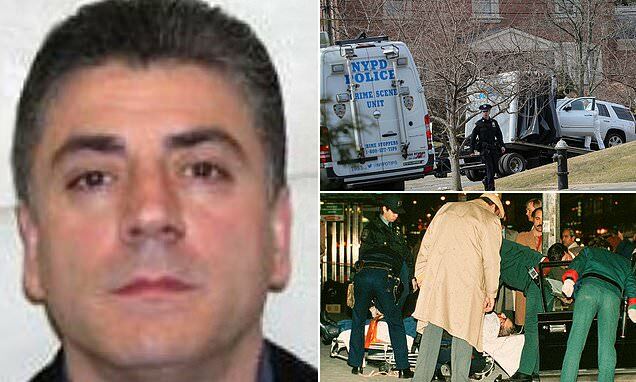 The grisly murder of Gambino crime family boss Frank Cali has stoked fears that the Mafia may be returning to the streets of New York City after more than three decades of peace. Cali, 53, was shot six times and run over by a pickup truck outside his redbrick house in the upscale Todt Hill neigborhood of Staten Island just after 9.15pm on Wednesday evening, sending shockwaves throughout the community. Authorities, including the FBI, are looking into whether the hit was authorized by one of New York's five Mafia families, or whether it was carried out by a 'cowboy' gunman. One former NYPD detective who investigated the mafia for years, Tommy Hyland, told Inside Edition that this murder feels personal. Cali's murder is the first hit on a Mafia boss since John Gotti arranged the assassination of then-Gambino head Paul Castellano in 1985. Aggressive federal prosecutions in the past 25 years decimated the ranks of New York's five Mafia families. The cases resulted in long prison terms for their bosses - Gotti included - and encouraged their successors to keep a lower profile. But the new generation still engages in old-school crimes - loansharking, gambling, extortion - that can make enemies and spark violence. This week, prosecutors in Brooklyn announced a case against a long-time Gambino associate accused of killing a suspected loanshark affiliated with the Lucchese crime family. Chief of Detectives Dermot Shea said on Thursday there has been a slight uptick in alleged mob-related violence in New York within the last year. But he said it is too soon to say whether that had anything to do with Cali's slaying.